Protestors are continuing to pile the pressure on the beleaguered Haigh Hall Hotel and those in charge of it. A Freedom of Information (FOI) request to Wigan Council has revealed Contessa Hotels co-director Craig Baker falsely told this newspaper visitors were being directed to the panoramic path because the route next to the landmark building was too steep. 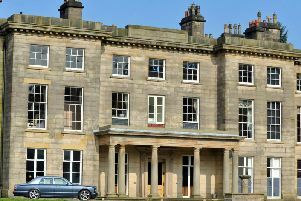 And the campaigners from the Friends of Haigh Hall Heritage and Open Access For All group have hit out at the interior decoration and overall state of the building. Pictures shared on social media reveal images of scantily-clad ladies prominently displayed in the 19th century stately home being run as a boutique hotel. And a shocking image from last weekend appears to show a window on the south side of the building almost completely falling out. However, the campaign group’s FOI to the town hall asking if this is the case came back with a rather different answer. The local authority replied: “The footpath from the council car park to the plantation gates does not fall under scope of the Building Regulations in relation to the building work being undertaken for the change of use to Haigh Hall. Campaigners have also turned their spotlight on some of the transformation of Haigh Hall’s interior into a 1920s Hollywood Regency look, which appears to include some rather controversial artwork. Images also show holes in the fabric of the building at the main entrance and serious problems with the windows, even in areas of the building where restoration is supposedly finished. Given that Contessa Hotels promised to spend around £6m transforming the hotel the latest shots have led to serious questions about the level of investment in the building. A campaign spokesperson said: “Downstairs we have a gaffer-taped dome, holes in the porch, portraits of half-naked women adorning the walls and newly and poorly-fitted cheap outdoor lighting. “A window is falling out on the renovated south side and we have photos of the lower windows which shows that for Contessa restoration means painting over the window rot with a bit of white gloss, after sticking a bit of putty in. “This is hardly a sympathetic and respectful restoration and we fail to see where £6m has been spent.